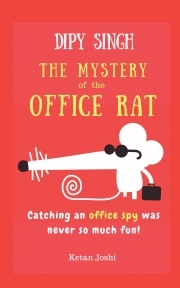 Description of "Dipy Singh- The Mystery of the Office Rat"
A rat is selling office secrets. The boss is tearing his hair out! It’s Dipy the detective to the rescue! What will happen now? Will the rat escape? Will the slackers be fired? Or will Dipy perfect a rat trap? The most hilarious detective story you will ever read! Ketan Joshi writes fiction, non-fiction and travelogues. He is the author of 'Bombay Thrillers' and the 'Three Men on Motorcycles' series - a #1 seller on Amazon India. Reviews of "Dipy Singh- The Mystery of the Office Rat"